I must admit that I really enjoy seeing any of the six Australian species of woodswallows. On the downside, we only can expect to see three of those six species in our garden. To see the remaining three species I would have to travel several hundred kilometres to the north. In fact, we only have fleeting visits from any of the woodswallows which occur in our area. They might hang around for a few minutes and then they are gone again. On most occasions I only see them swooping around high in the sky, presumably catching flying insects. 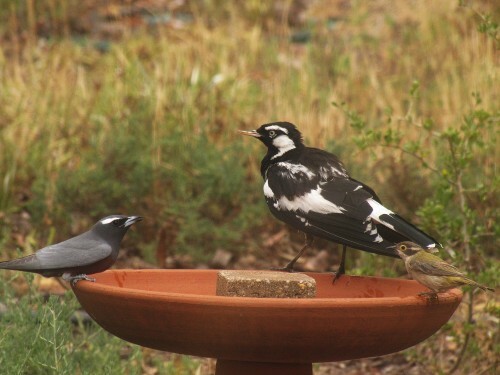 On one special occasion two species flew in together and settled briefly – but long enough for photos. 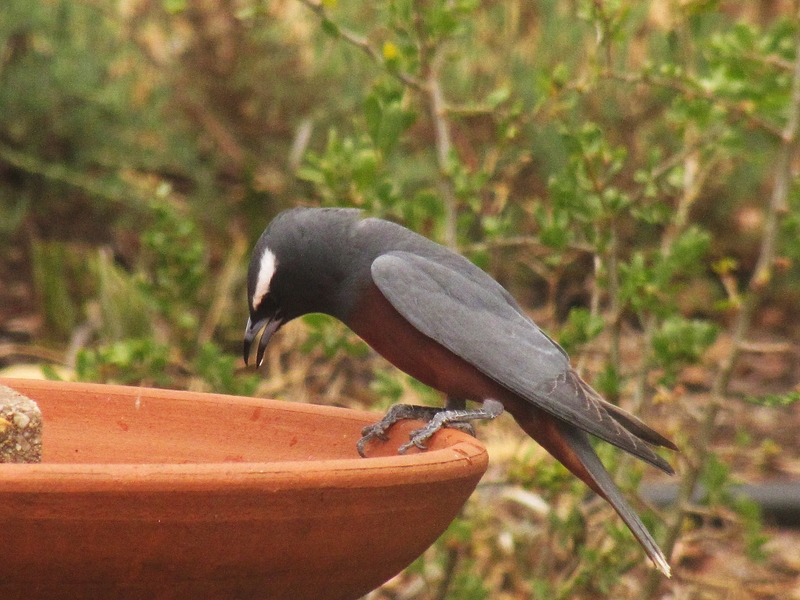 Several weeks ago on one of the very hot days we are experiencing here in South Australia a solitary White-browed Woodswallow came to visit one of our bird baths – as recorded in the photos shown today. It was my wife who spotted it first and she was quite surprised; I don’t think that she had seen one up as close as this one. Because it was very thirsty it stayed around for quite a few minutes, long enough for me to take a good number of photos. At one stage it was not afraid to share the water with an Australian Magpie Lark (see below), a much larger species.